Following the recent high-profile fake honey scandal, new and independent research from Macquarie University in collaboration with the National Measurement Institute has unveiled, for the first time, the scale of the adulteration problem—almost one in five Australian honey samples were found to be adulterated with cheaper sugar products such as corn syrup or sugar cane. The new research, published in Scientific Reports, was undertaken using the only internationally-accepted testing method revealing the problem of adulteration is a persistent global problem. Australian honey products were found to be the least adulterated, at 18 percent, while 28 percent of European honey, and 52 percent of Asian honey was found to be fake. 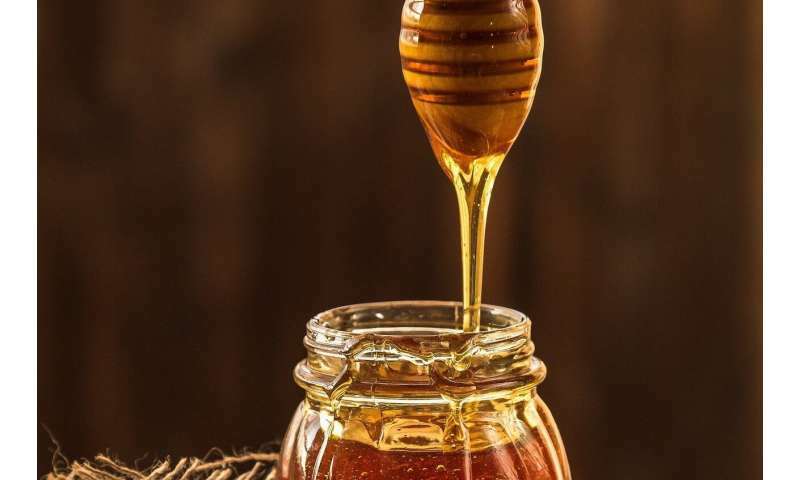 Amongst the biggest concern relates to New Zealand's premium Manuka Honey – the new study found that the two samples tested as part of the study of 95 commercial honeys were adulterated. "Each year, there are 10,000 tons of New Zealand's Manuka honey sold globally," said lead author Professor Mark Taylor of Macquarie University. "New Zealand only produces 1,700 tons annually, so it's not hard to do the maths and see there is a problem with the product being sold." Honey is considered the world's third most adulterated food, with additions of cane, rice sugar and corn syrup along with the mislabeling of its geographic origin, common fraudulent practices in the honey market. "The findings all point to the same thing: that we need better regulations to ensure customers can have confidence in the product they are being sold," said Professor Taylor. "Currently, consumers are paying for a product that is not what it says it is on the label." "Australia is a leading honey producer, so something needs to change so that Australians, and those buying our honey globally, can have confidence in the products," said Professor Taylor. "In the meantime, my advice to consumers would be to buy from local honey producers. If you can see directly where the honey is coming from, the chances of the product being adulterated are far less likely."